Home to alligators and Mardi Gras, oil refineries and shrimp boats, Louisiana is bordered by the Mississippi River to the east, Texas to the West, Arkansas to the North and the Gulf of Mexico to the south. The state’s capital city is Baton Rouge, but the cultural capital of Louisiana is without a doubt New Orleans, where the state’s French and Spanish heritage are always on display. The most tropical of all the contiguous US states, Louisiana is known for its short winters and long sultry summers, and for the hurricanes and tropical storms that sometimes sweep the Gulf Coast and flood the state’s swampy lowlands. For an immediate estimate on shipping rates to, from or within Louisiana, use our online quotation system. Although the Port of South Louisiana, located on the Mississippi River between Baton Rouge and New Orleans, is the largest shipping port in the Western Hemisphere by volume and the largest in the world by bulk, many of Louisiana’s products are shipped to port states California and Washington. Ohio, Illinois, Michigan and Washington are other important destinations for products made in Louisiana. Louisiana’s general trucking guidelines are as follows: length is restricted to 65’-0” on non-designated routes (50 foot trailer) and 59’-6” on designated truck routes; overhang is restricted to 8’-0” rear and 4’-0” front; weight is restricted to 80,000 pounds GVW; width is restricted to 8’-0” on non-designated roads and 8’-6” on designated roads; and height is restricted to 13’-6”. Permits for routine oversize shipping, trucking and transport are granted as follows: length is determined on a case-by-case basis, weight is restricted to 108,000 pounds on 5 axles, 120,000 pounds on 6 axles, 132,000 pounds on 7 axles and 152,000 pounds on 8 axles, width is restricted to 18’-0” on roadways and 14’-0” on interstates, and height is restricted to 14’-8”. Truck travel in Louisiana is permitted from one-half hour before sunrise to one-half hour after sunset, Monday through Saturday. Loads less than 12’-0” wide, 90’-0” long and 100,000 pounds may travel on Sundays until 1:00 PM. 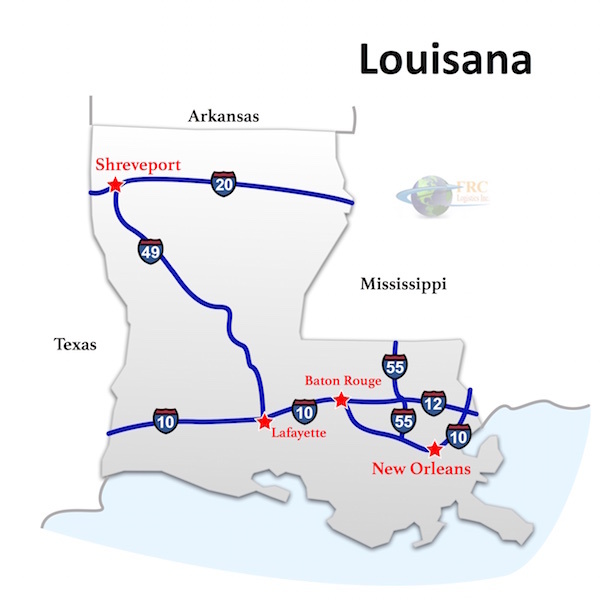 Interstates crossing Louisiana include north-south routes I-49, I-55 and I-59. East-west routes include I-10, I-12 and I-20. A statewide toll system exists for roads and bridges across the state, including interstates. The Geauxpass system allows for pre-paying of tolls online. The state’s 511LA website offers detailed information about construction or weather conditions that may make travel hazardous or difficult for large loads.